In my personal version of Toy Story, my iPod plays the role of Woody – a former favorite toy that just can’t compete with the latest technical toys. 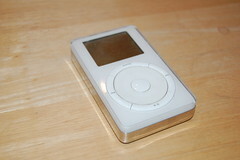 It is hard to pinpoint when an era begins or ends, but I believe the iPod Era passed. I was an early adopter on the Apple iPod. I still have my first, the 5 GB Firewire model with a real wheel. It was introduced in October 2001. Back then it was only available on the Mac. I spent weeks converting my CDs into the iTunes library. It was pretty clear to me from the get-go, that this device was going to change music – and I was proud to be in the early wave. I had lived thru it before – in the 1980s when Sony introduced the Walkman. The Walkman made cassettes cooler than vinyl for the first time. The CD (which came later) was great for audiophiles, but terrible for those needing portability. My walkdisc or whatever it was called invariably skipped while walking. Once again, portable music meant radio. But the iPod was impervious to skipping. Its user interface was intuitive and logical. I kept building my library and buying bigger capacity iPods. It was really quite amazing – a huge portable library that was easy to navigate. I remember on a trip the topic of “Who’s on First” came up, and someone had never heard the famous Abbott and Costello routine. No problem, I had it (that even surprised me). I took my iPod on every flight and trip. I bought multiple docking stations and accessories (all obsolete). I had a 60 GB version in my office for a couple of years and I don’t think it made it through its huge musical playlist more than 3-4 times. I was skeptical of the video versions, but became a fan. The screen was too small for my likes, but I used it regularly as a player with a TV. Especially on long car rides – the car has a built in TV-DVD, but it always skips. The iPod with video-out was a better solution and it was practically an in-hand rental store with its selection. I’ve noticed lately that I haven’t taken the iPod on my last several trips. I prefer my Android phone for both music and video. My frustration with the iPod has been increasing over the years. It is very picky about video and won’t play a lot of my content. Video-out on the newer iPods require a special (very large) cable – my older cable in my travel bag (which was quite portable) moved out years ago. I also find iTunes annoying – I have to load my content into iTunes, then a playlist, and and then sync with the iPod – far too many steps while rushing out to the airport. On my mobile phone, I just drag the files in one step. On my last trip, the hotel had one of those iHome clock radios with a dock connector (it also had a standard headset type wire for audio-in), and looking at that dock connector that made me think – how quaint (that same feeling when I see a digital phone). How one vendor got hotels across the country to upgrade to a proprietary dock equipped clock radio is an amazing story. But the technology today seemed as out of place to me as CRT television being in that room. Both formats were standard issue oh so recently. I still have my 5 GB iPod, but I don’t have a computer with a Firewire port anymore (certainly not the big fat version). I have a (full) drawer full of broken iPods and accessories. Now the folks at Apple have redefined mobility with smartphones and tablets. Who still buys iPods? Of course many do, and the product is far from end of life – but the era is over. People still buy cassette players too. I hope the next big era is the return of quality. Mobility has caused a lot of compromises – voice quality, compressed music quality, dropped calls. Quality, which used to be important, hasn’t been a critical factor for decades. But that will change, and it won’t be at the cost of mobility. I am looking forward to the return of quality. No more CODECs that lose quality like MP3 does. No more dropped calls! Wideband (HD) audio and HD video are early indicators it is coming, but the quality era hasn’t begun yet. Nor will it until a few more things happen such as widespread 4G and a major battery break thru. Sign me up for that era.